I guess there are two main reasons as far as I can see. Firstly we see a lot of injuries with pain as the primary complaint. It’s thought that one in seven attendances at emergency departments are due to pain (not all are musculoskeletal trauma I’d like to add).2 Given this, there’s a lot of mobrbidity out there and therefore a lot of treatment opportunities as well. Secondly we’ve got a growing evidence base of cardiovascular harm3caused by NSAIDs (particularly in acute use) as well as the long standing recognition of renal4 and GI effects so revisiting our use of these drugs is important. This was a multiple centre, double dummy, double blinded, randomised control trial. All patients with acute (<48hrs), non penetrating, minor extremity MSK trauma attending one of the research sites were screened for participation. The sites included two university hospital EDs, an urgent care centre and general practices. Participants who were enrolled were given tablets of active drugs alongside dummy medications depending on which group patients were randomised to. A dummy trial design meant that everyone took the same number of pills and avoided bias from things such as the colour or number of tablets being taken. Each group was also covered with omeprazole. The routine use of omperazole isn’t standard practice in the UK. This could bias the study by reducing the side effects from the NSAID groups. However the authors make the point that a previous (very small) study had shown that the absorption of paracetamol may be increased with lansoprazole so it’s affect may not be that clear. On the whole however I don’t think PPI co-administration is too much of an issue. For those who are interested, NICE have very kindly developed a clinical knowledge summary for PPI use with NASAIDs which you can access here. Anyway back to the study. 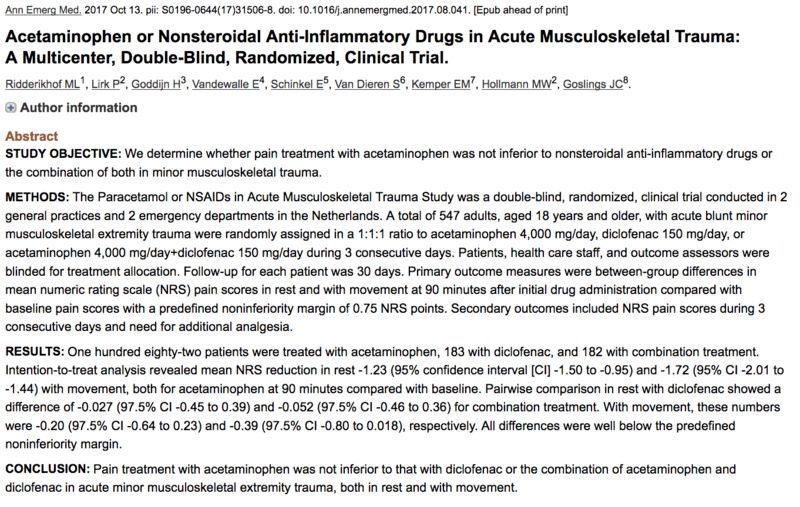 It was designed as a non inferiority trial, that is to say they were not looking for one group to be better as in a superiority trial, just that the paracetamol group had pain scores which were no worse than the other groups. This kind of trial is conducted if there’re other benefits to using a drug other than it being better than the alternatives. For example it could be cheaper or have fewer side effects. The trial was in three phases; the initial 90 minutes, the first three days, then then 3rd to 30th day post recruitment. Prior use of analgesia, joint dislocation or multiple injuries are fair exclusions as are patients with a previous ADR or known contraindication to the drugs. Non dutch speakers were also excluded for follow up reasons (they needed to follow up with telephone consultation). The also excluded fractures and wounds. I guess from my point of view it would be nice to know if paracetamol is adequate for my patient with a metacarpal fracture but the authors were quite clear it wasn’t the aim of this study. This was the between group difference in pain scores of the paracetamol, diclofenac, and paracetamol with diclofenac groups. Perfectly reasonable I think. 8,243 consecutive patients were assessed for eligibility, 7,696 patients, were excluded leaving a total of 547 patients assigned to treatment. Thats’ quite a lot of exclusions to me so when I’m faced with a patient with a painful injury I’m wondering whether I can truly apply this research to everyone (probably not). There were no significant between group differences at baseline. Pain scores across all groups a rest and with movement fell with analgesic administration. They found that there were no significant between group differences in the reduction of pain scores. Only paracetamol had resulted in clinically significant reduction in pain at 90 minutes when at rest. There was an a priori sub group analysis of patients grouped by age which found that there were no significant treatment differences between the groups when accounting fro age.This is a sensible approach not least because there’s good evidence to show older people perceive pain differently5 but also they are more likely to suffer form the side effects of treatment. Really easy to implement the results of this study. Wouldn’t result in increased costs and might reduce them. Only studied minor musculoskeletal trauma and excluded fractures and wounds.This may limit the generalisability of the findings. Use of blanket proton pump inhibitors isn’t standard practice in many countries. I’m not sure if diclofenac is the first line NSAID of choice for people although is one of the most efficacious when looking at the oxford league tables. Unable to ascertain if there are significant differences in adverse events. Im wondering how often a patient will wait 90 minutes before asking for more analgesia. I think they’ve done a pretty good job to be honest. We can always tear apart a study if we try hard enough but the authors have conducted the trial well and found paracetamol alone appears to be non inferior to diclofenac or diclofenac in combination with paracetamol at 90 minutes although the results aren’t spectacular for any group. I think paracetamol alone will be my first line analgesic in the treatment of minor musculoskeletal trauma of the extremities. Trelle S, Reichenbach S. Cardiovascular safety of non-steroidal anti-inflammatory drugs: network meta-analysis. British Medical Journal. http://www.bmj.com/content/342/bmj.c7086.long. Published January 11, 2011. Accessed December 1, 2017. Lautenbacher S. Age changes in pain perception: A systematic-review and meta-analysis of age effects on pain and tolerance thresholds. Neuroscience and Biobehavioural reviews. http://www.sciencedirect.com/science/journal/01497634. Published April 2017. Accessed December 2017. Previous: Previous post: The ED Spa. Wellness and Support in #Virchester. St.Emlyn’s.